Are you looking for a delicious chicken recipe with a difference? If you are, you’ve found it! Here’s my tray-baked chicken with tomatoes and olives for you to enjoy. Feast your eyes on the finest tray-baked chicken with tomatoes and olives! It’s straightforward and fun to make this great dish. Simply follow the instructions below and get the perfect result. 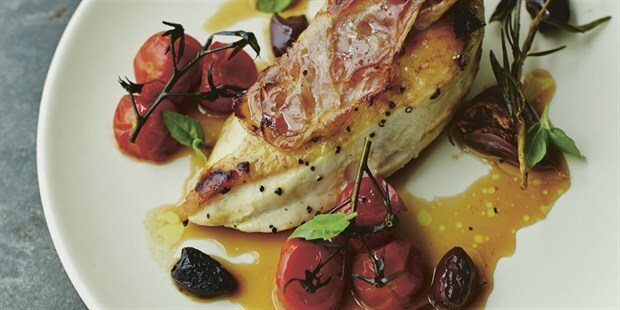 Place the chicken breasts in a roasting tray and add the bunches of cherry tomatoes. Bash the garlic cloves in their skin and place in the tray along with the rosemary. Drizzle everything with olive oil and season with salt and pepper. Pop everything into the oven for 10 minutes, then drape the pancetta slices over the chicken and scatter in the olives. Bake for another 15 minutes, then set aside to rest for 5 minutes. 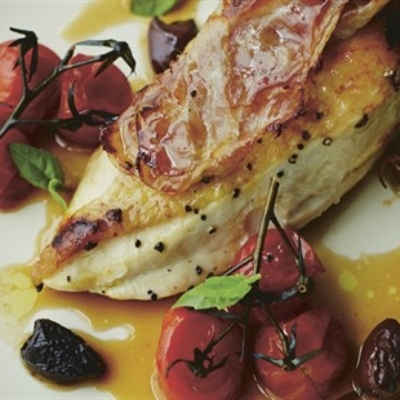 Put each chicken breast on a plate with some tomatoes, olives, garlic and juices. Sprinkle with the basil leaves and serve. 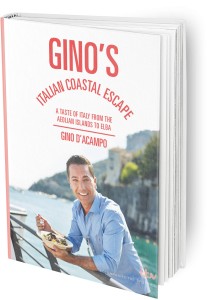 Once you’re done, simply sit back and enjoy your tray-baked chicken with tomatoes and olives and don’t forget to check out other great authentic Italian recipes including great antipasti recipes, Italian pasta recipes, Italian soup recipes, Italian beef dishes and authentic pizza recipes.